That’s what head coach Bruce Arians said Monday, according to the Arizona Cardinals website, after the team announced that they added the first woman to coach in the NFL, Jen Welter. Welter joins the Cardinals as a training camp/preseason intern and will coach inside linebackers. She’ll be working alongside former Green Bay Packers defensive coordinator Bob Sanders and 12-year veteran linebacker Larry Foote. Breaking new ground is nothing new for Welter. 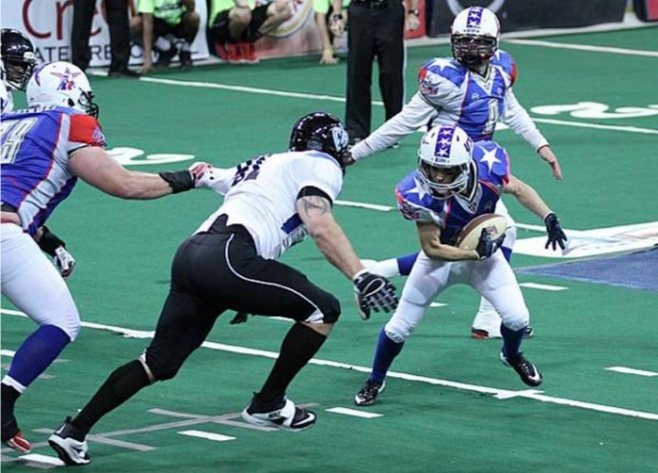 After playing collegiate rugby and then 11 years in the Women’s Football Alliance, Welter played running back for the indoor football league Texas Revolution. She was the first woman to play a non-kicking position in a pro football game. Back in March, Arians was asked a question about the possibility of women coaching in the NFL. Arians answered saying, “The minute they can prove they can make a player better, they’ll be hired.” A Revolution staff member reached out to Arians shortly after, recommending that he should speak with Welter if he was serious. Arians invited Welter to the Cardinals’ OTAs and found her to be very passionate about football. That passion convinced Arians that Welter was for real and should get an opportunity to coach with his staff. She brings with her a masters degree in sports psychology and a PhD in psychology. Cardinals Pro Bowler Patrick Peterson has already welcomed Welter to the team on Twitter. The bottom line, from what both Peterson and Arians are saying, is that this is about doing work and improving the club. The easy comparison to make is in another major sport as San Antonio Spurs head coach Gregg Popovich hired Becky Hammon to join his staff as an assistant coach last season. Hammon led the Spurs, recently, to a Summer League title and her prospects of being a head coach in the NBA are not a pipe dream by any degree. Expectations are no different for Welter’s coaching trajectory in the NFL, as Bleacher Report’s Mike Freeman writes. Ignorance from some fans, select players, and people who like the sound of their own voice on TV is inevitable. We see it all the time and my solution is always to just change the channel. Fortunately, the reaction has been mostly positive across social media and sports news outlets so far. The Cardinals organization is no stranger to being progressive either. Arians praised his employer last night for their consistent effort in promoting diversity, having hired the first African-American head coach and general manager tandem of Dennis Green and Rod Graves back in 2004. Vice President of the United States Joe Biden recognizes that as well. It’s a groundbreaking move for sure…one that will open the door for women who won’t be hired just for the sake of diversity, but because they are the best for the job. More in sports, movies, television, music and food on Facebook and Twitter.